We get a run through of Mandela's (Idris Elba) life, beginning with his younger days working as a lawyer in an Apartheid-run South Africa. From that very early stage, it is evident that this legendary man always had the back of his people and would fight for what was right. We then see his entry into politics and his change in views. Not a change in his beliefs mind you, but a change in mindset that he, with the help of others could make a difference. Later, as we see his life of imprisonment, we witness another change in his mindset as he turns to a non-violent way of thinking. For me, Nelson Mandela's name and non-violence have always been synonymous with each other. I was not aware that he was originally imprisoned because of his involvement in strategic political bombings. I guess I had always focused more on his post-imprisonment life. Anything earlier than that and I wasn't really old enough to understand or remember. Mandela: Long Walk to Freedom does a good job of showing us the evolution of a man and his beliefs, but it struggles in showing why the events that occur outside (while Mandela is imprisoned) actually happened. All we see of those events is rioting and Winnie's (Naomie Harris) involvement as a leader encouraging violent action. I would have liked to see more of the 'why' behind these riots. At least a bit more than the obvious 'Apartheid is bad' reasoning. 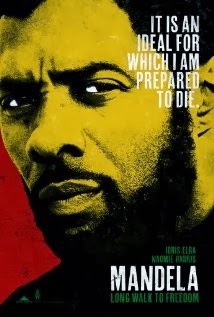 Elba delivers a strong and worthy performance of Nelson Mandela in this adaptation, looking and sounding more and more like Mandela as the film progresses and he ages. Naomie Harris also stands out as his wife, displaying both loyalty and devotion to her imprisoned husband and her political causes. I think that this film gives a good feel for the man who became an icon of peace and forgiveness, but that it could have been stronger if we were given a better look at the world around him. Despite that, I learned quite a bit about Nelson Mandela that I didn't know before. For that I am glad that I saw this film. While it wasn't quite as good as I had hoped, I'd say that it is worth giving a watch as a rental when the time comes in a couple of months. - Is it bad that at one point Elba is delivering one of Mandela's impassioned speeches at a rally that I almost expected to here his 'Today we're cancelling the apocalypse!' line from Pacific Rim? - I had never known that Winnie was actually his second wife. - From the slightly distracting department: as the film progresses, they do a fairly good job of aging Elba to help portray the amount of time that has gone by. They don't do so much to age Harris other than a hairstyle change or two. So when Mandela gets released from prison, he appears much older than his wife.